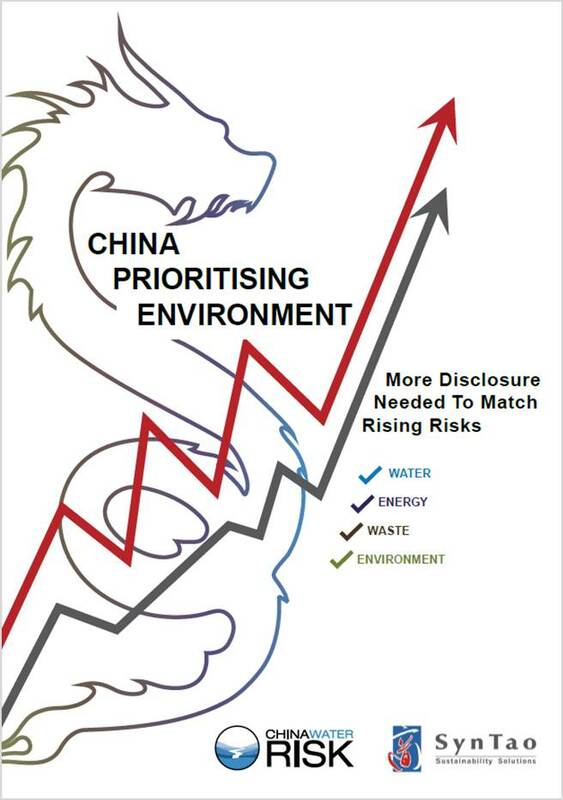 CWR & SynTao launch their new joint report, “CHINA PRIORITISES ENVIRONMENT: More Disclosure Needed To Match Rising Risks”. 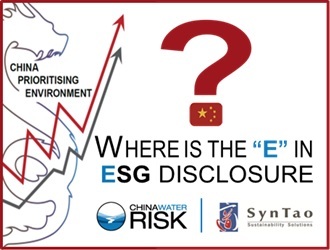 With China moving to mandatory environmental disclosure we thought it was a good time to take stock on where Chinese companies are on the Environmental aspect (E) in ESG disclosure. The report does this by looking at disclosure levels on the environment and three subcategories (energy, water & waste) for companies across six sectors (agriculture, automobile manufacturing, coal, electricity, oil & gas and smelting). A deep dive into the disclosure of the top five listco’s by market cap for each sector was also done and can be found in the report. The report can be accessed here and summaries in English here and Chinese here. Meanwhile, check out our 8 key takeaways below. Why did we do this report? Well, environmental and water related risks have consistently been in the World Economic Forum’s Top Five Global Risks for the last eight years. Hurricane Harvey in 2017 cost the US between USD70-108 billion. Troublingly, climate change exacerbates these risks. Already their persistent and material impacts are shifting the regulatory landscape, which in turn is creating mainstream risks. It follows then that the finance sector should be working on identifying, valuing and managing these risks so to build a resilient global financial system. While action to do this has started, the assessments are dependent on the underlying corporate disclosure, which is still lagging, largely inconsistent and not decision relevant. China, facing serious environmental challenges and recognising the immediacy of the risks is moving towards mandatory environmental disclosure for its exchanges with a tentative 2020 deadline. This is necessary if the country is to embed environmental and water risks in its credit policies as it has said it wants to. Given China’s actions we thought it was a good time to do a status check on where Chinese companies are on environmental disclosure. Check out our 8 key takeaways below. 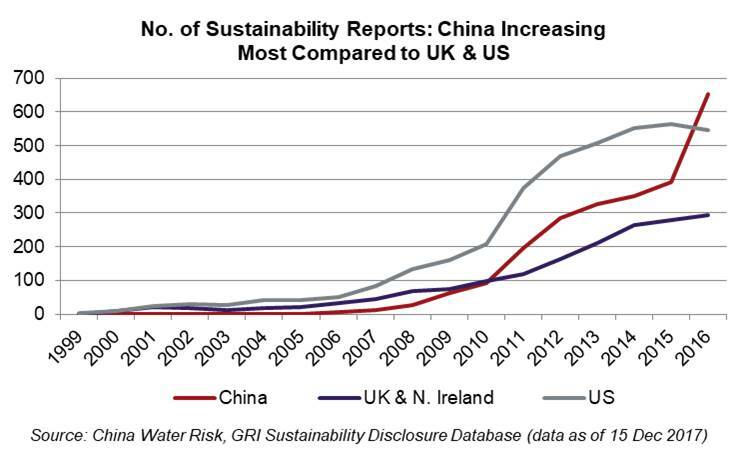 A comparison of historic issuance of sustainability reports for China vs the United Kingdom & Northern Ireland (combined) and the United States shows China’s epic rise (see chart below). China has gone from its first sustainability report in 2000 to 652 reports in 2016; 100+ more than the US in 2016 and 300+ than the UK & Northern Ireland. Moreover, China is the only country of the three to strongly buck the slowing trend from 2014 to 2016. These findings are not surprising given that China is moving towards mandatory environmental disclosure for its exchanges and that Chinese companies are in close proximity or among some of the greatest environmental risks with severe air, water and soil pollution in China. Not only are they feeling the impacts from this pollution but also the stringent regulations the Chinese government is implementing to clean-up. While the increasing numbers of sustainability reports in China and globally are encouraging, there is still a long way to go before it becomes mainstream practice. China’s two exchanges (Shanghai & Shenzhen) have been pushing CSR/sustainability related disclosure since 2006. Then in 2016 China released the ‘Guiding Opinions on Establishing a Green Finance System’, which said that the country’s exchanges are to move to mandatory environmental disclosure. Since then a tentative 2020 deadline has been discussed. The mandatory information disclosure system will be established in three steps before the 2020 deadline. Part of this system is already underway, led by the China Securities Regulatory Commission. In 2017, key polluting companies were required to disclose environmental information. Then in 2018, other additional companies have been required to either disclosure environmental information or to explain the lack of disclosure, similar to that of the “comply or explain” directive of the Hong Kong Stock Exchange. Then finally in 2020 (the tentative deadline), all Chinese listco’s will need to disclosure environmental information. Other exchanges around the world are also acting on environmental disclosure (see table below for review of actions by key global exchanges). However, the central issue of voluntary versus mandatory disclosure remains. The majority of exchanges taking action is with a voluntary guide or a “comply or explain” directive, which is thus at the discretion of the individual company and does not effectively tackle the issue around mandatory or consistent disclosure. 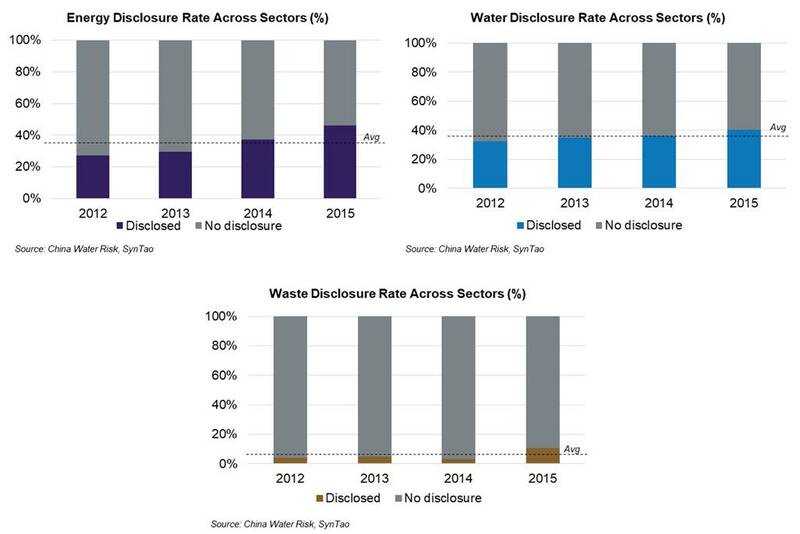 Positively, we found that environmental disclosure by Chinese companies increased year-on-year for the four year period analysed (see chart below left). Starting at 43% in 2012 and increasing to 56% in 2015, a CAGR of 6.8%. The most significant increase was in 2015 where the disclosure rate increased by 6%, double that of 2014. This is not surprising given that it was in 2014 that China declared war on pollution, including a push for greater disclosure and transparency. However, while positive there is still clearly room for improvement. Especially since the majority of disclosure is either on 1 or 2 of the total 5 indicators analysed (see chart above right). Only 2 companies disclosed on all 5 indicators for the entire four year period; one in the automobile manufacturing sector in 2013 and one in the coal sector in 2015 (red bands in chart right above). 2) This equal weighting bucks the global trend where energy disclosure is usually markedly more than water. Disclosure on the third subcategory, waste, while it increased, only reached 11%, notably lagging the others (see chart below right). At the sector level, we expected those facing greater regulatory pressure to disclose more and the trend holds. Analysis found three leaders, two mid-performers and one laggard. Coal, oil & gas and automobile manufacturing are the top three with environment disclosure rates of 75%, 75% and 72%, respectively. They also are the top three sectors for all disclosure subcategories except in one instance, the waste subcategory, where oil & gas is joint bottom with agriculture. With clear and significant implications for air, water and soil pollution they face significant regulatory pressure, thus, their top performance is not surprising. Somewhat surprising since they face similar regulatory pressure as the top three sectors is mid-performers electricity and smelting, with lagging disclosure rates of 47% and 48%, respectively. Meanwhile, agriculture is the clear laggard, disappointing on all fronts with only a 20% environment disclosure rate. Sector performance in each disclosure category is shown in the table below. During analysis we also looked to see if company ownership and exchange listing influenced disclosure. We found that a higher State-Owned Enterprises (SOE) sector composition largely points to higher disclosure. This makes sense given that under the updated guidelines of the State-owned Assets Supervision and Administration Commission of the State Council, all central-level SOEs are mandated to publish CSR reports. As for exchange listing, we found that the majority of listco’s across exchanges have environmental disclosure rates below 50%. This is particularly the case for the Shanghai Stock Exchange and the Shenzhen Stock Exchange, where only 13% and 11% of lisco’s have equal to or above 50% environment disclosure rates. Comparatively, the Hong Kong Stock Exchange had 29% and Non-Greater China (exchanges like the New York Stock Exchange, London Stock Exchange etc.) had 50%. China’s shift to mandatory disclosure should remedy the Shanghai and Shenzhen findings. 3) Lack of reliability: Unlike financial reports, third party audits are not mandatory for sustainability reports resulting in incidences of fraudulent reporting. According to SynTao’s database only around 4% of reports are audited and has been the case for the last several years. Mandatory consistent and decision-relevant environmental disclosure, which exchanges can drive, is the way forward so that environmental disclosure becomes mainstream practice. Indeed, there is increasing global discussion on the need to move beyond “boilerplate” disclosure. In China Water Risk’s investor survey, better accounting for water quality risks was just as important as complete and consistent disclosure: 94% vs 96%. Additionally, investors in the survey also felt that stock exchanges can do more with 86% wanting to see “mandatory disclosure required by exchanges”. This sentiment has also been seen among other investors, including Blackrock, Rockefeller & Co and recently major investor advocates like US SIF: Forum for Sustainable and Responsible Investment and UNPRI pushed the US Securities and Exchange Commission to require annual, uniform sustainability reporting from public companies. China is indeed leading the move to mandatory environmental disclosure. It has to, in order to embed environmental and water risk into its credit lending policies, as it has said it wants to. While these are positive objectives, as found in this report, there is still a way to go before disclosure from Chinese companies meets this and reflects the rising risks. At the heart of many global supply chains, what happens in China has implications. It is important that challenges be overcome and environmental disclosure levels improve as this data is key to advancing Environmental Risk Assessment work on quantifying environmental and water risks, and ultimately building a resilient global financial system.